We are already steering towards change with digital evolution all over. With this change all over and we are cheerfully acclimating with this change, we are easy to get hoodwinked by many, under the claim of services that are actually not offered. Tier level certifications for Datacenters are one such thing, moment! Do we actually know what tier levels in Data center are? Basically Tier defines the levels of availability of data from the DC to the requested location. Availability is defined by the level of tiers, higher is better. Telecommunication Industry Association (TIA) and Uptime institute demarcate tier levels. American National Standards Institute (ANSI) has accredited TIA’s standard and technology that is out-and-out for Information and Communication technologies products. TIA has engaged with other international standards like ITU, ISO and IEC for Global integration. Whereas, Uptime Institute LLC is a group of companies in education, publications, consulting, certifications, conferences and seminars for the enterprise data center industry. Well! Reason behind this information is that it is important to know these details of standards under which tier certification falls. It is equally important to know about each tier level, let us see them further. Tier certifications are nothing but the standardized approaches for defining uptime and data security of the data centers; it helps in measuring data center performances. [Basis the Tier level, businesses can expect availability of their hosted infrastructure.] Here are the features and availability of data center level descriptions of tier certifications. This is the basic category of certification, it has a single distribution path with no built in redundancy. A DC with a Tier I level cannot be a choice for hosting critical applications, though it can be an option for small business websites or for blog hosting, etc. for whom uptime isn’t a must have aspect. It can meet or exceed all necessities of tier I certification; we can say it as an improved version of tier I certification. It features redundant capacity. Annual and occasional shutdowns are probable for maintenance work and due to some unplanned disruptions in critical environment. A Data Center or a Hosting provider that holds a certification for this tier level can be appropriate for medium sized businesses. 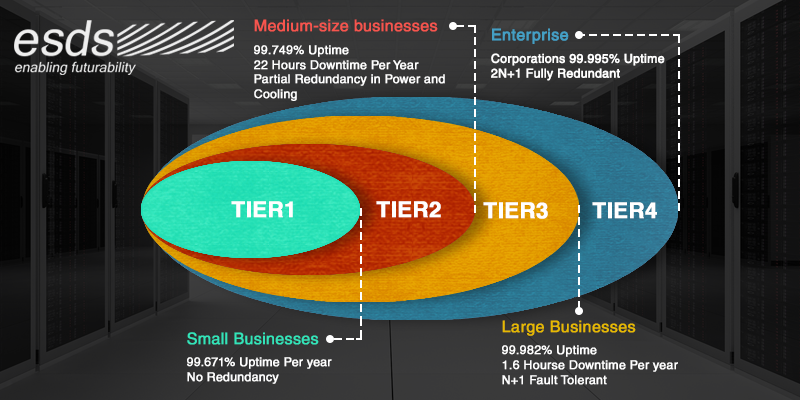 It meets or exceeds all the necessities of tier II, again an improved version of a previous one, but we see a big difference in terms of improvement of uptime from tier II to tier III. It also provides onsite backup along with required operations. This certification also involves the large costs of operational infrastructure. 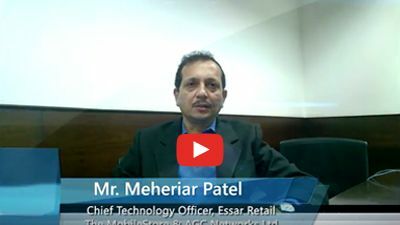 There are very few data centers in India that hold an active Tier III certification and ESDS Software Solutions Pvt. Ltd. is one of them for design. There may be providers who might claim themselves to be tier III certified but in reality, it is either a part of the DC or a specific infrastructure that complies with the certification standards. 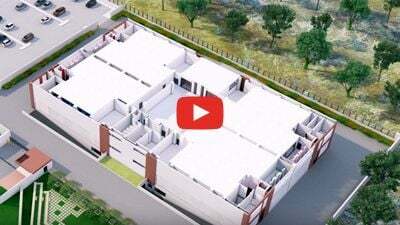 Providing 99.982% availability and maximum uptime does not necessarily mean that Datacenter is tier III certified, at this stage complete infrastructure of data center is engrossed rather than mere data center. In this tier shutdowns reduce and datacenter can be concurrently maintained with few unplanned disruptions are usual in critical environment. This level is appropriate for large sized and mission critical businesses that come under the categories such as PSU, BFSI, IT, ITES, ecommerce etc., to whom uptime becomes a critical part of operations. When can be the right time to choose Tier III? May be the best suitable answer for this can be, when the data to be stored is sensitive, requires secure hosting. As mentioned before it can be used for mission critical businesses or for high priority operations that are proportionally related with financial aspects and may lead to losses if there are disruptions in power. Tier IV: Tier I + Tier II + Tier III + fully Fault tolerant system for all components. It’s the highest level of recognition where very few are certified with this level globally. It meets or exceeds all the requirements of tier III, it is the strongest architecture (design & facility) or tier level for data centers and concurrently counts larger costs too. There is hardly any downtime in this level IF the host abides by the standards & guidelines given by the Uptime Institute. It also provides onsite backup along with more than required or expected operations. Redundant capacity or redundancy defines here alternative systems that can be used as a substitute during shutdown, failure or any temporary disruption. In layman’s terms, more the tier level, more can be the dependability is the basic theory behind. Complexities, performance, CAPEX and OPEX increase with each tier level. It has been observed that people are prone to get confused when it comes to tier III and IV certifications; this confusion becomes reason for providers to trick and present their services as best they are offering. Above mentioned parameters are not sole that are considered when it comes to actual certifications. Online Marketing Executive at ESDS Software Solutions Pvt. Ltd. 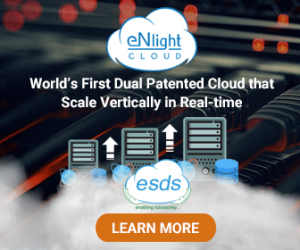 Does your Data Center have TIA / EIA 942 Standard ?